The former England fullback is currently the "Kicking Coach" for the senior England rugby team and also works at the RFU's National Academy. Callard joined Bath from Newport in 1989 before going on to makes his international debut against the All Blacks in 1993. 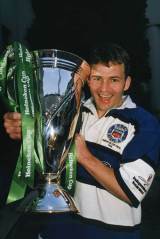 His most memorable performances at club level came in the 1998 Heineken Cup final when he scored all of Bath's points in a 19-18 win over the French side Brive in Bordeaux. Later that season he was appointed to the role of assistant to Bath coach Andy Robinson and went on to become the head coach of the club in 2000. In 2002 he became the head coach of the England Under 21 side and before moving on to join the national Academy in 2005.